Background: The human gut contains approximately 1014 bacteria, belonging to hundreds of different species. Together, these microbial species form a complex food web that can break down nutrient sources that our own digestive enzymes cannot handle, including complex polysaccharides, producing short chain fatty acids and additional metabolites, e.g., vitamin K. Microbial diversity is important for colonic health: Changes in the composition of the microbiota have been associated with inflammatory bowel disease, diabetes, obesity and Crohn's disease, and make the microbiota more vulnerable to infestation by harmful species, e.g., Clostridium difficile. 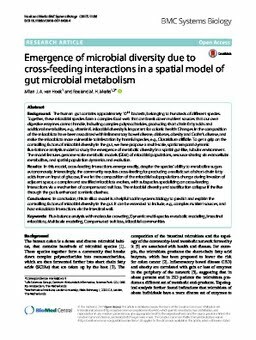 To get a grip on the controlling factors of microbial diversity in the gut, we here propose a multi-scale, spatiotemporal dynamic flux-balance analysis model to study the emergence of metabolic diversity in a spatial gut-like, tubular environment. The model features genome-scale metabolic models (GEM) of microbial populations, resource sharing via extracellular metabolites, and spatial population dynamics and evolution. Results: In this model, cross-feeding interactions emerge readily, despite the species' ability to metabolize sugars autonomously. Interestingly, the community requires cross-feeding for producing a realistic set of short-chain fatty acids from an input of glucose, If we let the composition of the microbial subpopulations change during invasion of adjacent space, a complex and stratified microbiota evolves, with subspecies specializing on cross-feeding interactions via a mechanism of compensated trait loss. The microbial diversity and stratification collapse if the flux through the gut is enhanced to mimic diarrhea. Conclusions: In conclusion, this in silico model is a helpful tool in systems biology to predict and explain the controlling factors of microbial diversity in the gut. It can be extended to include, e.g., complex nutrient sources, and host-microbiota interactions via the intestinal wall.